I had the good fortune yesterday to attend a great party for Modern Spaces in the brand spankin', not-yet-opened Testaccio Ristorante. I've had my eye on them for quite some time, curious about the space that's been so well hidden for these last couple of months. But alas, the time has come for Testaccio to open (officially on October 24th) and seeing it for the first time last night has certainly whet my appetite. I was awed by the gorgeous and spacious interior. The front has a nice bar that welcomes you, from which you're led into a narrower area with a couple of tables seating smaller parties, culminating in a squarish open room with more tables, a huge stone pizza oven, an oversized wine rack wall as well as an elevated platform with more tables. I'd say that the front is social and loud whereas the back is a bit more private and romantic. All furniture, appliances and fixtures are modern but don't look like they're trying too hard. I love the semi distressed walls and mirrors, exposed wooden beams and the art deco-ish chandeliers. The lighting is perfect actually, not too dim but bright enough to admire your food--and your company. We sampled a few items, representative of the upcoming menu. They were very generous with the portions and kept replenishing plates automatically and sometimes even upon request. The margherita pizza stood out to me with its crispy, thin crust, a light tomato sauce and fresh basil. It was a clean and uncomplicated taste that was very comforting. 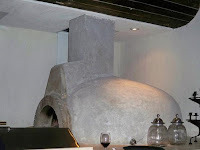 I just loved the char on the crust from the stone pizza oven, which gave it a homey, rustic feel. 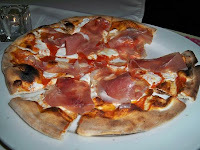 The prosciutto pizza (pictured above) was also very enjoyable and the prosciutto di parma was especially tasty. We also liked the spicy prosciutto that was served separately. The quality of the meat was excellent, with a strong kick to the senses at the last bite. A few other things, which were simple but didn't go unnoticed were the flatbreads topped with macarpone cheese, figs and mint. This dish was similar to what I tried at Testaccio's station back in June at the Taste of LIC event. I loved it because of the creaminess from the mascarpone, which went nicely with the sweet, seedy figs and fresh mint. The whole bite was luxurious yet also refreshing and in a way, palate cleansing. I enjoyed the melon, cucumber and mint spears, which were once again a straightforward dish but a wonderful way to refresh your palate. The concept was a good idea and I could see myself serving it at a dinner party as an appetizer. Last but certainly not least were the flaky pastries filled with macarpone cheese with a fresh raspberry poking out the side. The filling was amazing, flavored beautifully with lemon zest and vanilla. It went down easily and I could've finished about a dozen little ones in one sitting. We loved the staff at Testaccio from the first hello to the friendly "see you soon." Everyone was accommodating, hospitable and ready to please. It was evident that they were excited to show off the hard work they've been putting into this place. The highlight was meeting the chef, Ivan Beacco who was lovely, charming and contagious in his passion for his restaurant. Most recently the chef de cuisine at Pepolino Restaurant in Tribeca, Ivan's resume is impressive, promising to bring "contemporary Roman" food to LIC. All in all a strong start Testaccio - keep it up, and I hope that you have a wonderfully successful opening! We just had dinner at Testaccio last night and I have to say I was not impressed. 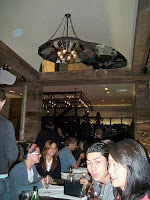 The interior of the place is beautiful but it did not over-compensate for the mediocre food and below par service. Our waiter was a reject diner waiter that seriously cheapened the place as everything he did and said felt rushed and abrupt....This is one of only a few times that the actual service received was almost offensive and really detracted from the experience. Not to mention that our waiter lost the credit card of the couple next to us....kind sketchey! We sat at the bar and had to wait 15 minutes to get bartenders attention asked for two glasses of wine and 5 minutes later was approached by another bartender asking us what we would like!!! We were sat down at a table with no glasses and missing silverware not to mention we were only given one menu....had to ask for a second. Started with the rice balls which were really good.....bread annoyingly came after our appetizer??? I had Veal rolled with prosciutto which was decent....Wife had Spaghetti carbonara which was way over salted...almost sent it back. For Dessert had profiteroles stuffed with vanilla ice-cream and alleged warm vanilla sauce...the profiteroles tasted stale, the ice-cream had freezer burn and the chocolate sauce was cold!!! Overall a poor experience.....may give it a try in a month or two and see if they have worked out their issues. But not impressed by any stretch of the imagination. I'm sorry to hear that Alex. Sounds like they have some opening-month kinks to work out. Curious to see how it will progress. I'm going to go there soon and check it out for a sit-down meal. I would love to hear what you think....will be checking back to read your review!